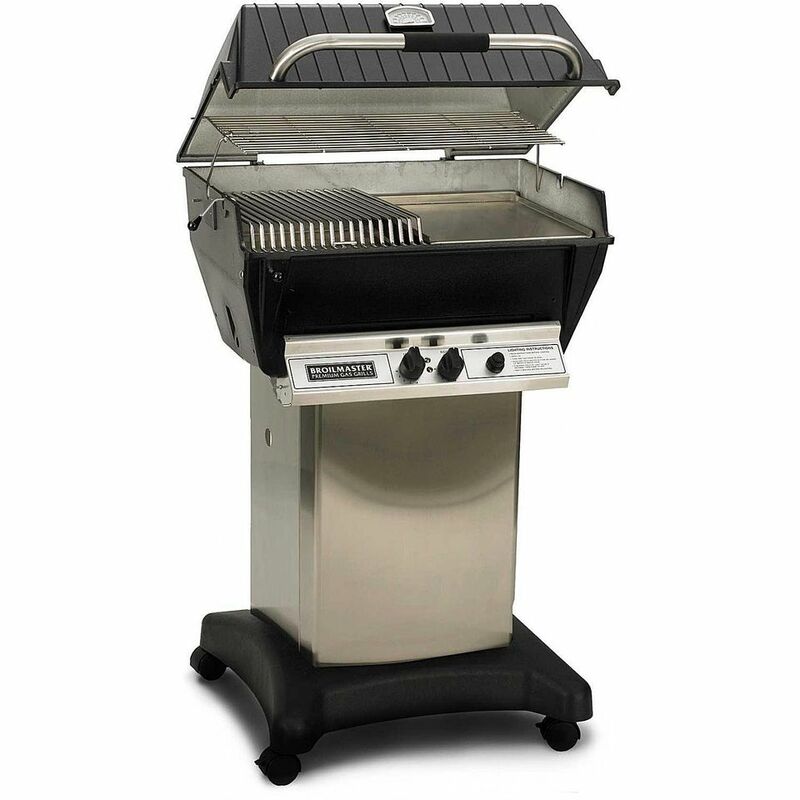 Long ago gas grills were made with cast aluminum bodies and quality, durable parts. Those grills, mostly gone now, were built to last for decades. They may not have been stylish or loaded with features, but they cooked well and many are still around today. Broilmaster grills are among the few of these kinds of grills still in business. This grill, the top of the Broilmaster line, is unique and built like a tank. This model has a unique shutter system that lets you switch from direct to indirect grilling with the flip of a lever. The stainless steel rod cooking grates can be set to three positions for temperature control. Multi-position cooking grates for versatility. Shutter system turns the grill to complete indirect space. Expensive for a basic cast aluminum grill. Two 20,000 BTU stainless steel bow-tie burners. 442 square inches of primary grilling space for a total cooking area of 695 square inches. 40,000 BTU maximum output from the main burners. Cast aluminum and 304 stainless steel construction. Multi-level cast stainless steel cooking grates. Stainless steel shutter system for smoking and baking. Natural gas conversion kit includes. Propane tank, cover, and optional side burner sold separately. Made in the USA by Empire Comfort Systems. Broilmaster is one of the few original manufacturers of gas grills, and little has changed over the past decades. This means a grill that isn't stylish or loaded with features but is a high quality, durable grill. The cast aluminum body and 304 stainless steel cart are warranted for a lifetime and will probably last longer than you will. The unique bow-tie burner delivers a very even heat. The shutter system and multi-level cast stainless steel cooking grates give you a tremendous level of versatility. The unique cooking system in this grill needs a little explanation. Placed between the dual control burner and the cooking grates are a set of thick stainless steel shutters. Open the grill functions like any other grill providing high heat output for direct grilling. You close the shutter with a lever on the front of the grill and switch the grill to indirect grilling. This turns the grill into an oven (they typically demonstrate this grill by baking cookies). If you put wood chips in the grill, it works like a smoker oven. With the wide temperature control, you can sear steaks or smoke ribs without having to do much more the switch the lever. The cooking grates on this grill are amongst the best in this price range. Heavy cast stainless steel gives you excellent heat retention and durability. More than this, these grates and be placed in three different positions so you can get right down to the flame for high-temperature grilling or lift away for slower cooking. This unique feature really makes this a gas grill that can do most anything. All this durability and the unique cooking system comes at a price. Looking at this grill you probably wouldn't be impressed and certainly would see spending around $1,600 for the basic configuration. Typically this grill is customized for the consumer. You start with a grill head, add in the mounting (cart, post, or ​built-in) and then add on whatever additional features you want like the side table mounted side burner. Due to its humble appearance, this is one grill that many people overlook. If you are looking for a gas grill that is serious about cooking and going to last for many, many years, you really should consider this one.